BRONX (WABC) -- The DEA seized more than 140 pounds of packaged heroin and $300,000 and arrested nine individuals Thursday afternoon after busting a heroin mill in University Heights section of the Bronx. Officials estimates that it seized more than a million individual prepackaged dosages, with a black market value at up to $15 million. 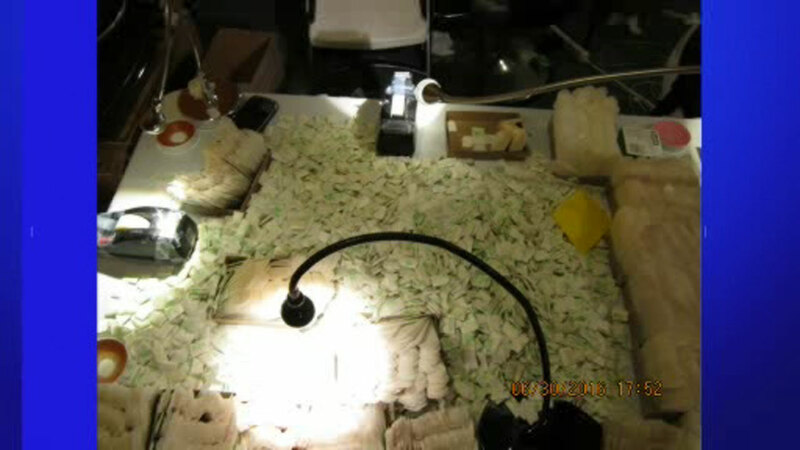 Police describe the heroin mill, located in a private three-story residence, as "staggering" and "one of the largest in New York City." "This was a highly organized operation, equipped with desk lamps, boxes, the rows and rows of glassine envelopes, said Special Narcotics Prosecutor Bridget G. Brennan. "Heroin filled envelopes were clearly labeled with catchy brand names, like Red Bull and Sweet Dreams, packaged in color-coded neon plastic, and stored in suitcases obviously ready to be transported. These traffickers adopted mainstream marketing ploys and operated with little fear of interference." Investigators made the discovery while surveilling 2115 Harrison Avenue, when they noticed two men leave with a black gym bag and a white plastic bag. After searching the bags and finding $50,000 cash, officers arrested Fran Hernandez, 30, and Willy Monegro, 39. Gendelson Marrero, 34, was noticed leaving the residence and stopped by police. Officials approached the Harrison Avenue residence and noticed several individuals run out the rear of the house and attempt to climb over a fence. They detained Cesar Cabreja, 36, Carlos Cabrera, 48, and Antonio Jimenez, 43. They entered the back door and discovered the exceptionally large, active drug packaging operation. Ysmairy Burgos, 19, Anyelo Asiatico Geraldino, 32, and Carlos Concepcion Paniagui, 43, were found inside. The defendants were arraigned Friday in Manhattan Criminal Court. One defendant, Fran Hernandez was previously arrested in another Bronx heroin mill just 15 weeks ago, and released on bail. The DEA expected that the heroin obtained would be used this Fourth of July weekend. "Agents and officers estimate that in another 20 minutes, the heroin would have been shipped out the door to be sold on the streets of New York and tri-state areas," said DEA Special Agent in Charge James J. Hunt. Police mark this as a huge victory in light of the nation's growing heroin epidemic, which continues to devastate the lives of millions of individuals and families. "With overdoses occurring at an alarming rate, the NYPD and its law enforcement partners have pledged to aggressively pursue those who engage in the heroin trade," said NYPD Commissioner William J. Bratton.